Nearly all of the asteroids that populate our solar system (and there are billions of them!) were formed by the self-destruction of planet Eden, or Marduk, more than 4 billion years ago, when it circled the sun in an orbit between Mars and Jupiter. You’re not likely to find that fact in any history books… that Eden was a planet between Mars and Jupiter that was destroyed by the massive technologies of its superhuman inhabitants! In fact, the only books you’re sure to find it in are my paperback The Project and my Kindle ebook The Noble-Savage Project. But I have no doubt whatsoever that nearly all of the asteroids in our immediate cosmic neighborhood are shrapnel from the late planet Eden. When the asteroids are pulled to Earth by our planet’s gravity they become fiery meteorites that often cause explosions and/or impact craters, like the minivan-sized meteorite that fell in the California mountains last week. Eden was much larger than Earth—like a basketball beside a bead—and, according to my ITC sources, it was inhabited by humans far superior to us modern humans in terms of biology, temperament, technology… and just about any other measure. Eden was probably far more opulent than Earth… richly endowed with crystals and metals… gems and precious elements. 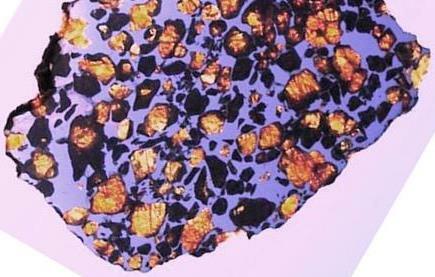 According to a recent space.com article, even the smallest metallic asteroid near the Earth contains more metal than all the metal mined in Earth’s history! What a paradise Eden must have been! By comparison, Planet Earth 4 billion years ago must have been a dusty piece of rubble. What’s left of Eden today, besides vague legends, are the many rich mineral deposits on Earth that were formed when wealth-laden shrapnel of Eden pummeled our planet time and time again over many millions of years. What’s also left of Eden today are the billions of mineral-rich asteroids and meteoroids floating among the nearby planets. Hence the coming gold rush in outer space. 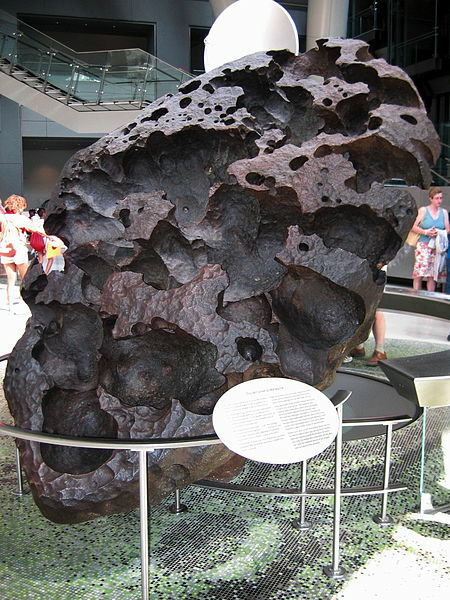 Iron-nickel meteorites, like this one at the American National History Museum, were formed as the iron core of planet Eden flew into space after the explosion and congealed into metal globs. And what’s ALSO left since the explosion of the physical Eden, is its spirit-world template… an astral planet that religions call Heaven or Jannah or Pitraloka. This entry was posted in After we die, what then?, Heaven and Earth, Other-worldly matters, Our ancient heritage, Science and Technology and tagged asteroids, eden, meteorites, pallasites. Bookmark the permalink. Fabulous posting Mark. You made my day, perhaps all of my days. I went back to read your link to Heaven and re-enjoyed my reading and understanding. I have read about the Lokas from other sources, and I enjoyed your link as well. It resonates. Undoubtedly, the asteroids will be mined as in the recent Spielberg movie “Cowboys and Aliens,” a reverse scenario wherein the aliens were mining Earth for gold, but the cowboys and Indians put them out of business. I have heard that a long time ago there was a group of ET beings who did mine gold here due to some pressing anomaly on their native planet which required gold. Have you ever heard of such? Thanks for the great post! Hi John, re-reading your comment a few months later, something else occurred to me. If the metal asteroids in our solar system are so richly endowed with gold, platinum, and such, it seems highly unlikely that advanced ETs would ever have invaded Earth to acquire metals… when it would have been so much easier just to glean them from the debris in the asteroid belt. So, no, I doubt that Earth was ever a slave camp for gold-mining aliens…. The Spielberg movie was fun, and yes, I’ve read those stories about ETs mining on Earth long ago, and I’m not so sure about that theory. It makes more sense to me that Eden exploded and its superhuman inhabitants became marooned on Earth. They weren’t passing through as visitors or pillagers; they were here for the duration as castaways. They forged the human destiny on Earth. I’m pretty sure of that scenario, based mostly on ITC contacts, and secondarily on the geological/archaeological evidence. I was not refering to the friendly Eden inhabitants plundering Gaia, but to others from other galaxy realms. I just showed Jean the picture of the asteroid ring between Mars and Jupiter. It certainly appears that there is enough distance between Mars and Jupiter to support a conveniently placed planet. However, this space supports a asteroid debris field with untold secrets. Am I correct in assuming that this asteroid field is in the same plane as the rest of the planets in our solar system? Hi John, I don’t know about other advanced species (other than the Edenite humans) who may have visited Earth at various points of our planet’s long history, nor their motives. Yes, the debris from the Eden explosion, which must have flown out in all directions, was gradually pulled into the plane of the solar system. Apparently that’s what bodies in space do over time. Gravity pulls stuff together while a spinning motion pulls it into a flat plane, like a solar system or galaxy.